The CCCDP funds hearing aids and other hearing devices for children with hearing loss in North Carolina. The original purpose of The W. Paul Biggers, MD Carolina Children’s Communicative Disorders Program (CCCDP) was to provide funding for hearing devices for children who are deaf and hard of hearing, whose families do not qualify for other public programs, and who do not have adequate income to obtain devices that are not covered by insurance. The North Carolina General Assembly has, since 1993, provided a grant to assist families in the state who have children with hearing loss. 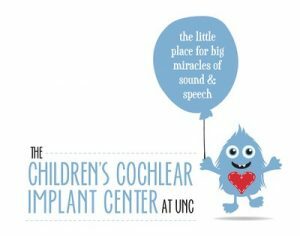 This grant is provided through the Department of Otolaryngology/Head and Neck Surgery Department at UNC-Chapel Hill and managed at The Children’s Cochlear Implant Center. It is funded through the North Carolina Department of Health and Human Services, Division of Public Health. The Program was proposed in 1992 by W. Paul Biggers, MD, and funds were received in the fall of that year to begin filling an urgent need: supplying communication devices, as well as UNC physician, audiological, and speech services for qualifying children with hearing and other communication disorders. The grant has provided financial assistance to over 1,500 children in 88 of the state’s 100 counties. Currently, over 400 children across North Carolina are getting hearing aids or implant assistance through the CCCDP. Children enrolled in the financial assistance program must be North Carolina residents under 21 years of age. Their acceptance is also based on family size, income, other medical expenses, and the limitations of insurance and other resources such as Medicaid. The financial criteria are somewhat flexible so that as many children as possible are served.